A long-wave trough is approaching Iberian peninsula from the NW, at surface a strong cold front coming into the region. A short-wave / weak frontal boundary over southern Alpine flank weakens. A MDT+ risk has been issued for parts of northern Italy with threat for excessive convective rain, which could result in dangerous flash floods and landslides. More than 150mm has already fallen on Sunday and another 100-200mm seem likely until 12z Monday. Expect further torrential rainfall with flooding threat over parts of Toscana and Emilia Romagna regions with very slow moving and maintaining intense storms within the large cluster trailing SE across Toscana. The main heavy rainfall threat will be maximized during the 00 – 12 UTC timeframe. 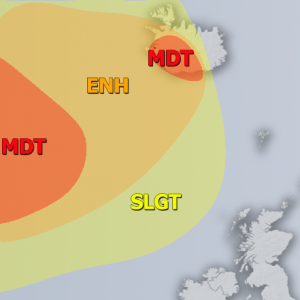 There are some uncertainities regarding the lifetime of the aforementioned large stationary cluster which precluded the upgrade into HIGH risk over the area at this time. Besides heavy rain threat, some marginal hail, strong winds and some tornado threat over coastal areas remain possible as well. A MDT risk has been issued for NW Iberia and surrounding areas with threat for severe winds, heavy rain, tornadoes and marginally large hail. 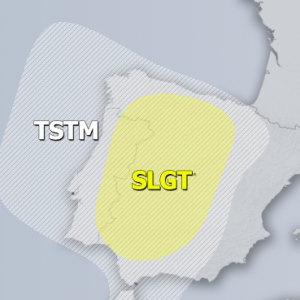 A SLGT risk has been issued for surrounding areas of MDT risk over NW Iberia and across the eastern Atlantic with threat for severe winds, heavy rain and marginally large hail. A SLGT risk has been issued for surroundings areas of MDT risk over north Italy into southern France with threat for heavy rain with flash floods, strong winds and marginally large hail.